A new landscape emerges, as Premier League finalizes deals in more markets. The Premier League, the region’s most valuable sports property, has inked deals with two more challenger brands this week, BeIn Sports for Thailand and New Zealand and Optus for Australia, following last month’s appointment of newcomer LeTV Sports for Hong Kong. Bidding dynamics have varied by market however, shedding more light on how sports economics and competitive battlelines are being recalibrated across Asia-Pacific. Australian rights commanded close to US$140 million, almost three times what the incumbent, Fox Sports, paid in the previous round. The price reflects rising demand for the EPL from emerging media owners in markets where the most popular leagues, such as the AFL and NRL in Australia, are contested by powerful incumbents. A different picture is emerging in Southeast Asia, however. Demand is more muted and the EPL as a driver property seems to be hitting a ceiling in terms of ROI. Rights for the next cycle in Thailand are thought to have gone for less than US$300 million, about US$50 million less than the sum paid by CTH, Thailand’s second-biggest pay-TV operator, for matches from 2013-16. Bidding in Malaysia, meanwhile, has gone to a third round, as the Premier League pushes to squeeze more value from a market experiencing weak economic growth. Malaysia’s biggest media company, pay-TV incumbent Astro, and BeIn are key contenders. Similar trends, hinging on the local hierarchy of sports rights, could play out elsewhere. Negotiations this week also started in Japan, Korea, Singapore and Vietnam, with India and Indonesia likely to follow in due course. Singapore has progressed to a second round, with domestic pay-TV providers Singtel and StarHub jockeying with BeIn for pole position, in a market regulated by cross-carriage laws for pay-TV. 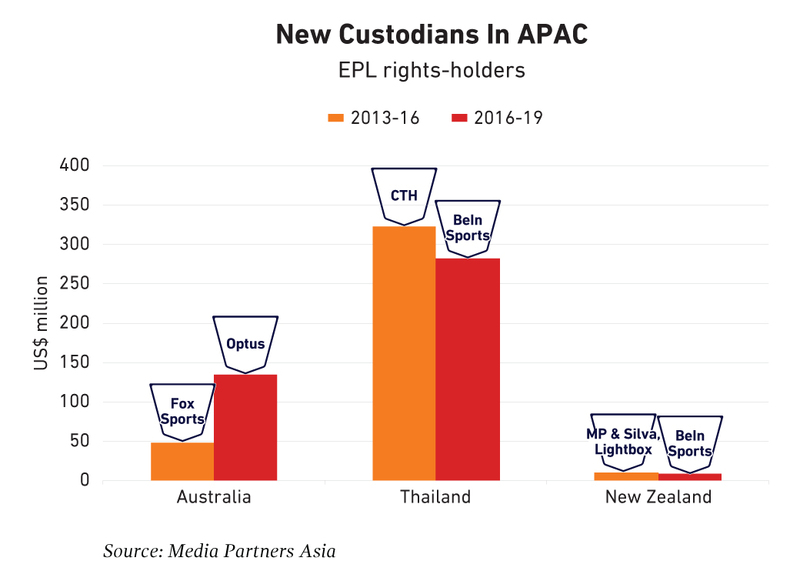 Wins for the next three seasons of EPL by relative newcomers to Asia’s sports marketplace open up plenty of options in Australia, Thailand and New Zealand. Optus, Australia’s second largest telco, has been cultivating its streaming ambitions under new CEO Allen Lew, former Singtel Singapore country manager who also used to run the telco’s media and consumer services unit, Digital Life. Optus, which has been building out its broadband base under Lew, is trending towards a 20% share of the fixed market. Last month, the telco also announced a three-year streaming and sponsorship deal with Cricket Australia, the sport’s national governing body, covering same day highlights as well as some live games. The EPL deal, which includes live broadcast rights, is of a different scale however. Optus could onsell the TV rights (with SBS a possible recipient) to offset some of its investment. Australia’s online video market should top US$400 million this year, ~60% derived from advertising. Digital subscriptions are mainly driven by entertainment, with room for sports to take a bigger share of the pie. In Thailand, BeIn’s swoop strikes a blow to the incumbent, CTH. More than half of CTH’s direct subs subscribe to its football package, although the operator has other sports to soften the blow, including Euro 2016, which could be complemented by other acquisitions and partnerships. Under new CEO Amarit Sukhavanij, CTH has also been pushing for more entertainment, kids and news content, to diversify its offering, broaden its audience base and compete more strongly with the market leader, TrueVisions. BeIn, meanwhile, now has a foothold and a few options to consider in one of Southeast Asia’s largest TV markets, where TV and video revenues are projected to grow at a 7% CAGR from 2015 to 2020. Potential partners include TrueVisions and CTH, as well as free-to-air, OTT and mobile operators, in one of Asia’s most diverse TV markets. 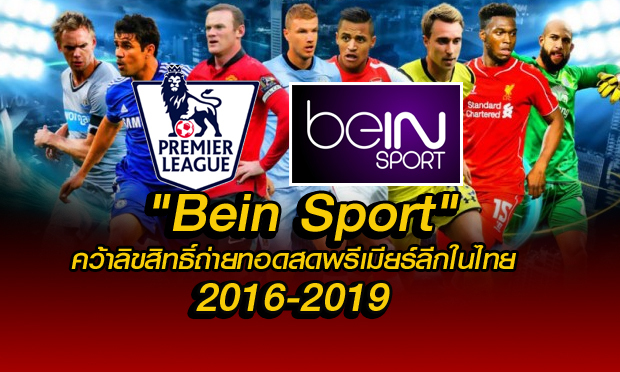 In New Zealand meanwhile, BeIn is thought to have paid less than US$10 million for the rights, a slight decrease on the previous round. Possible tie-ups there include Sky, New Zealand’s incumbent pay-TV operator, as well as telco leader Spark, which unveiled its own paid offering called Lightbox in August. แทงบอลออนไลน์ สมัครแทงบอล บริการเว็บพนันบอล เล่นบอลตลอด 24 ชั่วโมง เว็บพนันบอลที่ดีที่สุดในไทย การเลือกสมัครคาสิโนผ่านเว็บพนันออนไลน์ที่พร้อมเปิดให้บริการได้ต่อเนื่อง 24 ชม.